Some of the popular modern landscaping materials include wood, metal and concrete. Many landscapers choose to leave the concrete surfaces a natural gray color. But, staining can be more fun, and can be done in one bold color or a variety of colors. Metal can be great for an accent to your garden, especially corten steel with a weathered look. You can use it in planters, as a retaining wall or even a privacy screen. 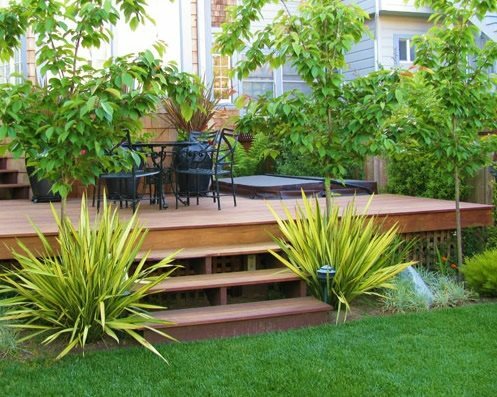 Adding a wood deck to your garden will give it an inviting look. Brazilian hardwood, such as Ipe, is rich in color. One of the number one goals of modern garden designs is creating contrast. Ornamental grass plants add color that pops out against any plain concrete wall. Orange and purple flowers draw your attention when planted near patio furniture with simple colors and finishes. Colorful shrubs, such as Knockout Roses, a Dwarf Burning Bush or a Rosa Glow Barberry demand the eye’s attention when you set them against a row of bluestone. Just be sure to be selective. You want to create contrast, but you don’t want your colors to be overwhelming. Contrast should only be created in two or three areas of your yard, not the entire garden. A paved area with a simple grid of green plants is a modern landscaper trademark. It can be done using stones, with green grass that grows where there would usually be grout. Or, you can pour concrete in sections, allowing thyme to grow between each section. Your modern look can be accentuated with architectural plants with unique textures. They’re interesting to look at, and give your garden a unique look. Also, add some containers to create patterns that can be changed when the mood strikes you. As the leaves fall from your colorful bushes, you can add color to that area with your potted plants. Two things you must pay close attention to when caring for your garden are weeds and water. Weeds create competition for your plants and flowers. They compete for garden space, as well as water. Check your garden regularly to ensure that there are no weeds soaking up the water your garden needs to grow. Water is needed for cell enlargement and cell division. If the cells don’t get enough water, the plants will start to wilt. The easiest way to make sure that your garden gets a sufficient amount of water is with an automatic sprinkler system. Sprinkler systems can be set to come on and go off automatically. And, if installed properly, they water your garden evenly. Check out some of the best sprinkler systems from Sprinkler System Store.